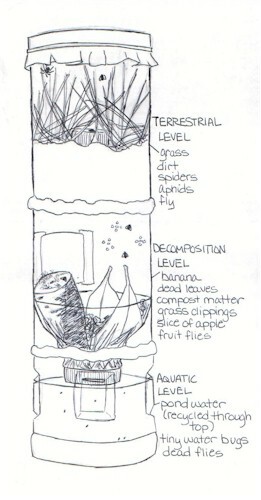 The ecocolumn is a self-contained environment with three separate levels: terrestrial, decomposition, and aquatic. Following are observations made over about a two week period. I began my ecocolumn with grass and soil in the top section with two small spiders; leaves, grass clippings, and a slice of apple in the middle section, with the door open; and water from China Lake in the bottom. There are no flies yet. Condensation is gathering in the aquarium section, and in the soil. I watered the ecocolumn ¼ cup. I could not see the spiders. I hope they havent starved to death, since there are no flies yet. Added 1/3 of an extra-ripe banana to the compost section. Condensation remains in the aquarium section and the soil. The water appears cloudy. A tiny black bug is swimming on the surface of the water. Temperature of 66 degrees farenheit. I finally spotted a fly in the compost section. The banana has begun to blacken more rapidly. Grass is beginning to die. The larger spider is still alive but has not spun a web. It stays on the roof mostly. There is no sign of the other spider. Watered ½ cup. Temperature of 64 degrees. There is now a fly in the compost level and in the surface level. I think the tiny spider has spun a web in the grass. Dead bugs float on the surface of the water. Temperature of 57 degrees. More of the grass is dying. The ecocolumn was moved indoors today and part of yesterday so that additional caulking could be applied to stop leaks, and so it could dry. The larger spider crawls around the roof of the terrestrial level, and the fly crawls all over the walls and grass. There is still a fly in the compost section that also climbs the walls. The banana is blackened and sweaty. Moisture is condensing in that level. I see no sign of life in the aquarium. Temperature of 58 degrees. Yesterday I watered an undetermined amount with water from China Lake. The water in the aquarium overflowed. Several tiny bugs are swimming around in circles beneath the surface, but they are too minute to see in detail. They swim very fast for their size. The water is a slightly murky yellow. Condensation has gathered at the top of the aquarium level. I left the hatch open today to catch more flies, without success. A tiny gray spider got in, though. The condition of the banana hasnt changed much. Some grass clippings seem to be growing hairy mold. No life observed in the dirt of the terrestrial level. The grass seems unhealthy. No sign of spiders or flies. Maybe they drowned when I watered the ecocolumn. I accidentally left the column in sunlight most of the day. Current temperature of 60 degrees. There are now at least four flies in the compost section, but none seem to have made it up to the terrestrial level. The banana is growing fuzzy-looking mold, and the grass clippings have blackened. Many tiny bugs are swimming in the yellowish water. There are at least two aphids in the top level, but no spiders are to be seen. Most of the grass is dead, and what is alive doesnt look very healthy. No life observed in the soil. Watered slightly less than one cup (recycled water). Temperature of 78 degrees. At least one aphid still lives in the terrestrial level, and one fly in the compost level. The tiny bugs in the aquarium still swim about. They seem to be bigger now, but they remain only specks. No other life observed. More grass is dead than living. I dont believe I need to water it again yet. The dirt appears moist, and there is a large amount of condensation in the compost section. About an inch of water was lost Friday and today while being transported by car.